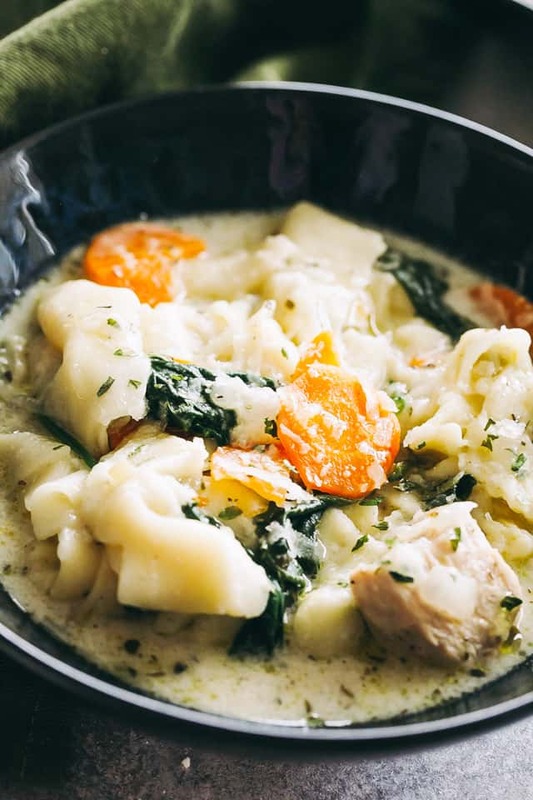 Instant Pot Creamy Chicken Tortellini Soup – Loaded with chicken, veggies, and cheesy tortellini, this is the easiest, yet most flavorful soup that needs to be a part of your instant pot dinner line-up! 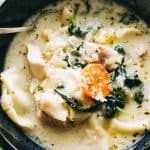 Instant Pot Creamy Chicken Tortellini Soup is a 20 minute creamy, savory and DELICIOUS soup studded with tender chicken bites, spinach, carrots, and cheese tortellini. Tasty and super easy to make, you’re simply going to love just how fast it all comes together. I love me some soup, friends! Really, really love. BUT I have a house full of pasta obsessed beings. No matter what I make – Baked Pesto Chicken, Pan Seared Sirloin Steak, for instance – there, right behind me, you will find my husband making a pot of pasta to go with what I prepared. In order to come to an understanding when we discuss soup, Creamy Tortellini Soup is where we all can and DO agree on. 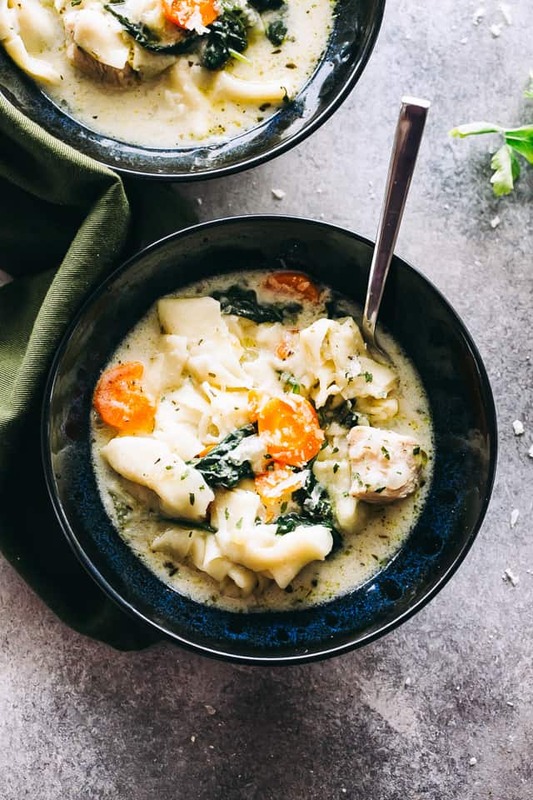 Just like any other, this Instant Pot Creamy Chicken Tortellini Soup is a bowl full of hearty comfort! Can’t you tell? Chock full of chicken, pasta, and veggies, yet my favorite part is that I got to prepare it in the Instant Pot! 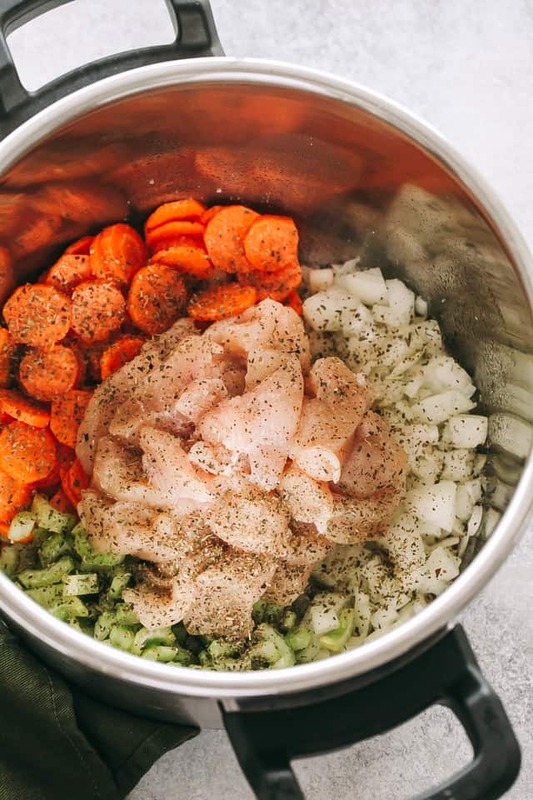 First, we are going to combine the onions, celery, carrots, garlic, and chicken in our instant pot and sauté until chicken is browned and veggies are beginning to soften; about 5 minutes. Dried tortellini, broth, and seasonings will also be added to the pot and sealed. The soup is going to cook in the IP on “manual” for 5 minutes; then, wait 10 minutes to release pressure. If you do not have an “Instant Pot”, cook the soup in a pressure cooker for 13 minutes before releasing pressure/steam. When soup has finished cooking, remove the lid, stir in spinach and half & half; continue to cook for 1 minute on sauté, or until soup is heated through. As is my goal with most recipes I make for Diethood, this is a ONE POT dinner made in under 30 minutes. It is also a complete meal, all in one bowl. That’s it. 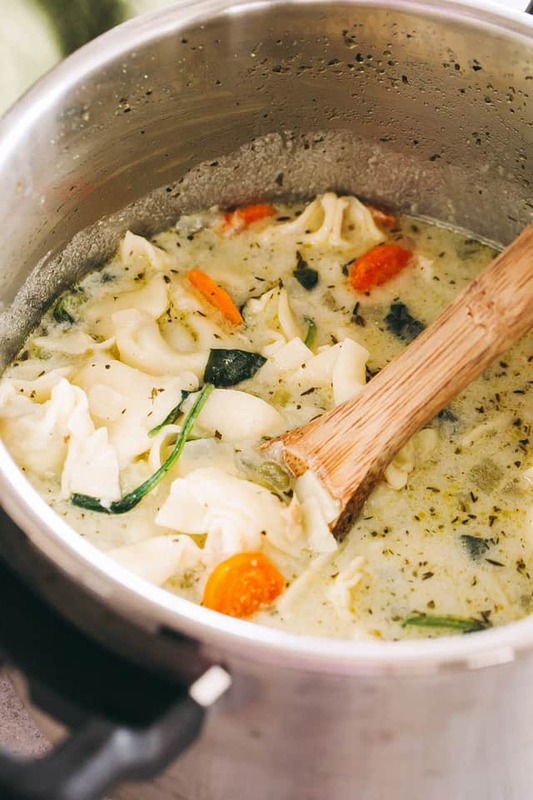 That’s this Instant Pot Creamy Chicken Tortellini Soup. It requires a bit of front-end chopping to prep the veggies and chicken, all in all, maybe 6.5 minutes of prep. In return, you will receive a cozy, warm, beyond delicious bowl filled with pasta + chicken + veggies + soup. 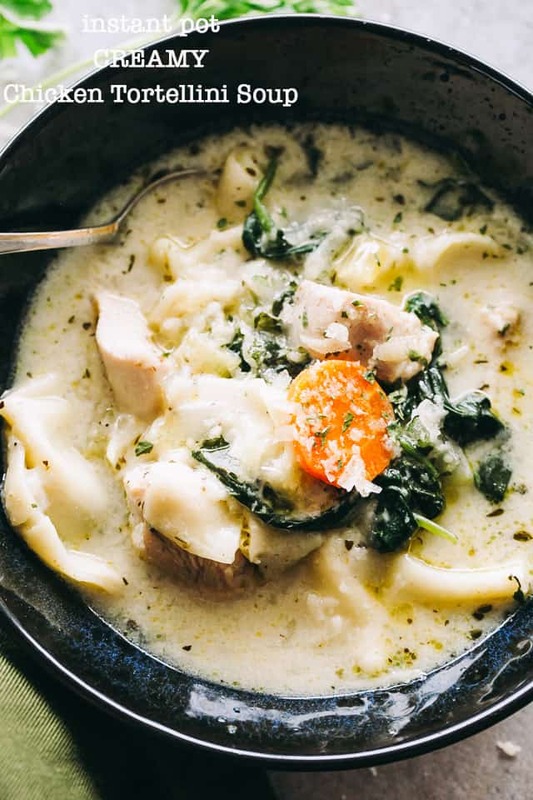 Loaded with chicken, veggies, and cheesy tortellini, this is the easiest, yet most flavorful soup that needs to be a part of your instant pot dinner line-up! Set your Instant Pot on “SAUTE” and melt the butter. Add diced onions, celery, carrots, garlic, and chicken; add seasonings, salt and pepper, and continue to cook for about 4 to 5 minutes, or until chicken is browned and veggies are just beginning to soften. Stir in chicken broth and tortellini; close the lid and lock it. Set the steam release to “SEALING”. Press “MANUAL” and adjust the time to 5 minutes. When the cycle is finished, wait 10 minutes and then manually release the pressure. Remove lid and press “SAUTE” again. Stir in the spinach and half & half; cook for 1 to 2 minutes, or until soup is heated through. *If you have a standard pressure cooker; lock in lid and cook for 13 minutes before releasing pressure. *This recipe works with dried tortellini. For frozen or fresh tortellini, add them at the end, together with the cream and spinach; cook for 3 to 5 minutes, or until tortellini is done. Check the instructions on the package to see how long they need to be cooked and follow the suggested time. How long would you cook if using frozen chicken? And is a serving 1 cup? I can’t wait to try this! I love tortellini! I’m definitely going to try this. Thanks for the recipe! Can left overs be frozen?. 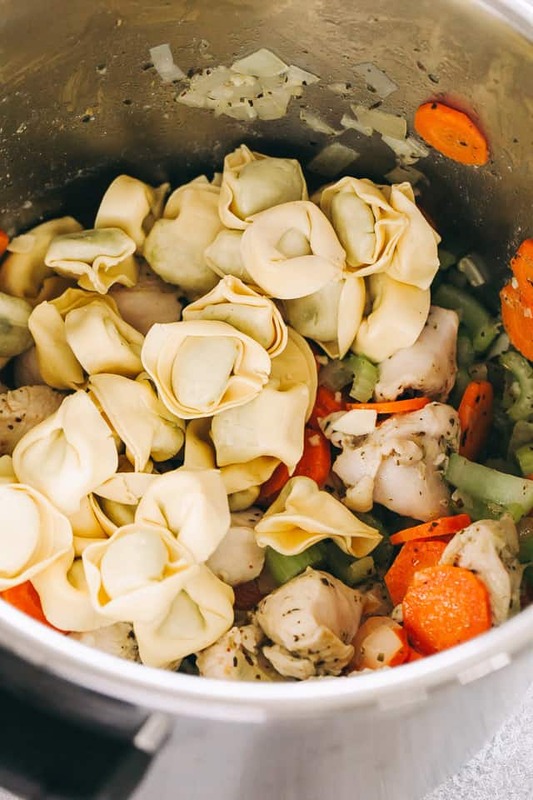 Yep, you can definitely freeze this soup, but the tortellini might turn out a bit soggy after it is defrosted. That has happened to me on a few occasions, but not always. To freeze the soup, just let the soup cool down completely, transfer it to large ziploc bags or airtight containers, and freeze it. To defrost, run the bottom of the freezer container under hot water for a little while, just enough to loosen…then place the frozen soup into a saucepan and slowly allow it to defrost over the medium-low heat. My Instant Pot is my BFF right now! I’m seriously craving this! I could totally gobble up TWO bowls! This looks so good with all sorts of great ingredients! This might be my new favorite soup to make in my IP. Always looking for new instant pot recipes. This one looks like a winner!